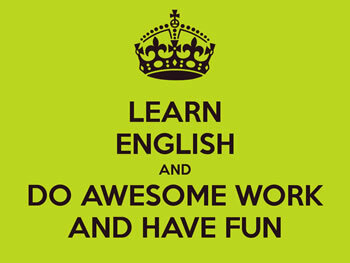 There are some simple ways to learn English easily. Speak it: The easiest way to learn any language is to start speaking it. Forget about learning vocabulary and grammar from a textbook, instead just start speaking it. You will learn the whole language by practice, by trial and error. Ask for input: Converse with people in English, especially native speakers and ask them for their input. Tell them to correct you if and when you use the wrong word or wrong grammar. This way you will learn and it won’t feel tedious. Read books, newspaper, magazines, and blogs: Read anything and everything that you can find in English. Seeing it and reading it will help you pick up English faster. Plus if you are interested in it, it will seem less like studying. Also reading it out loud helps your pronunciation. Listen to songs, audio books, and podcasts: If reading is not for you, then listen to anything in English, be it songs, audio books, or podcasts. Hearing how others speak, and pronounce the words will make it easier to pick up the language. Sing along to your favourite songs; try to mimic the singer’s pronunciation. Watch TV, Movies, and YouTube videos: Who doesn’t like TV? Watch English shows, movies and videos, to see how they speak and pronounce their words. Bonus, if you try to have a conversation with the character on screen. Listen in: Listen to other people’s conversations to see if you can follow it. How much of it can you understand? What were they talking about? Any particular words you didn’t understand? Look them up later or ask somebody what they mean. Dictionary: Keep a dictionary on hand at all times, or use a dictionary app, preferably one that translates from your language to English. Build up a habit to look up any and all words that you come across and don’t understand. This will improve your vocabulary immensely. These are just some of the ways that you can learn English. While they won’t make your task completely easy, they will try to help make things easier.